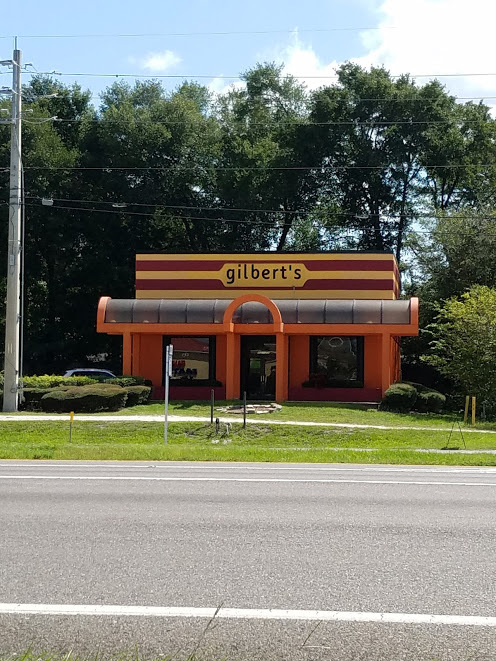 Gilbert’s Social opened last weekend and I was geared up to go, a big fan of his Fernandina Beach spot Gilbert’s Underground I knew it was going to be a most enjoyable dining experience. Not willing to wait for the weekend when my friends are more inclined to dine out I made a lunch run and it was a happy experience. 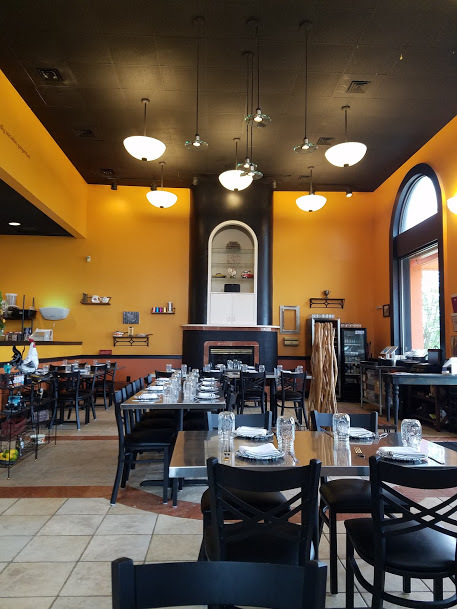 The building has been updated after being empty for quite a while; the space is a nice size with the table placement designed to allow room for diners and the servers to maneuver around. Bright open kitchen all shiny and new allows the diner to get a glimpse of chef life. The color palate bright with few adornments makes for a cozy understated atmosphere. I was greeted at the door by the GM who let me chose my own spot; he took my drink order and left the menus for me. They offer soups, sandwiches, meats and three meats with three sides, just the meat, sauces and sides, and dessert. 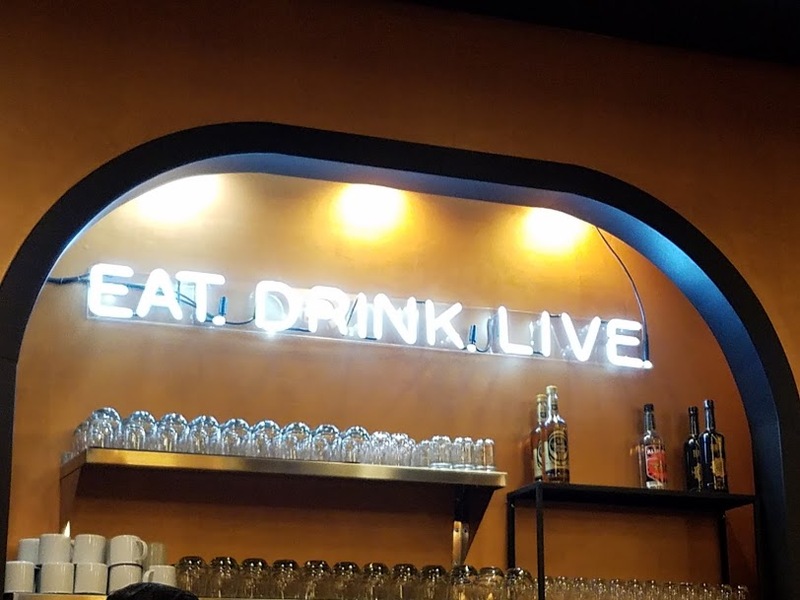 On the libation side Gilbert’s Social offers a generous wine and beer menu, plus five handmade sangrias, if you are undecided chose a flight of all five for $30 or if you are not a drinker Gilbert’s also has a Kool -Aid flavor of the day. I am well familiar with the astounding BBQ that chef Gilbert makes and was on a path to the smoked brisket with sides, went back and looked at the soup, I knew I had to have the Southern Ramen, now for those of you who have eaten ramen before, with all its wonderfulness, of greens, jalapeno, meat, and a basic broth, this is nothing like any of those soups. This dish was complex with deep layered of flavors I was almost overwhelmed with the beauty of how each ingredient could be identified as I ate. 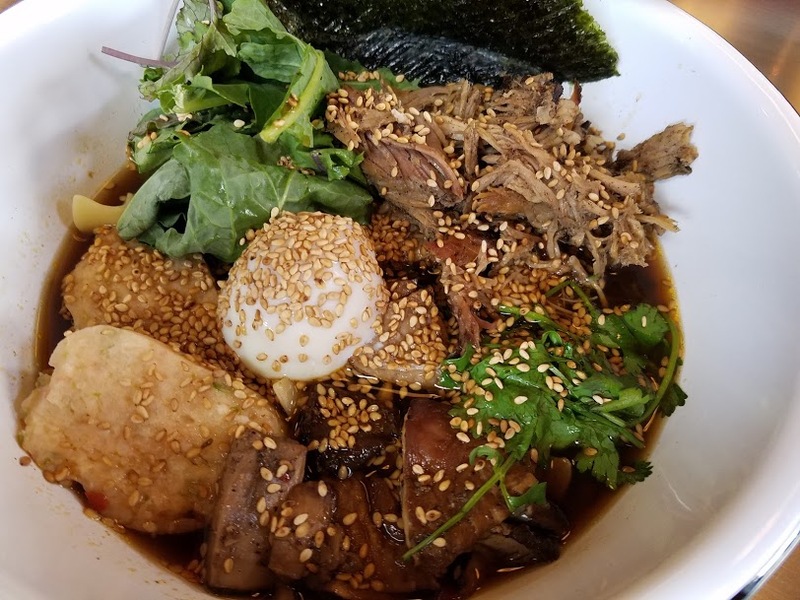 Rich dark broth made from smoked ham hocks, a massive portion of pork, baby kale and roasted nori, radish, mushrooms, jalapeno, shrimp cake soft egg, egg noodles and toasted benne seeds sprinkled all around. This is a dish you think about as you are eating it, I never wanted it to end. 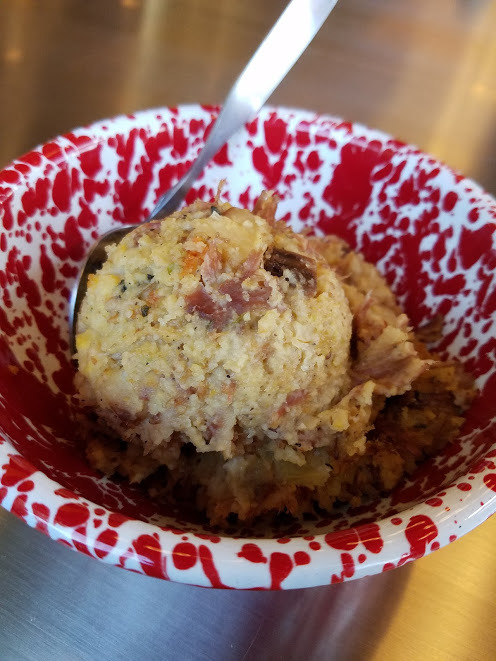 The portion was so generous, it left little room for much more, but I did have to try the side of Corn Bread Dressing which is a dish I normally do not eat, but today was my lucky day, dressing, moist full flavored and well-seasoned, I devoured it. So the review will not end here, two nights later I was back with one of my besties to delve deeper into the food Chef Gilbert’s creates; we started with the Curried Goat soup a pungent combination of curried goat, field peas, Moroccan spices, pickled raisins, crushed cashews and a dollop of raita, a combination of chopped cucumber and spices. I know from experiences goat can be bony so I inquired about it and was told that yes there may be some bones in the soup I only encountered one small piece that did not interfere with the enjoyment factor. Much like the ramen soup listed above there were many layers of flavor with each bite. 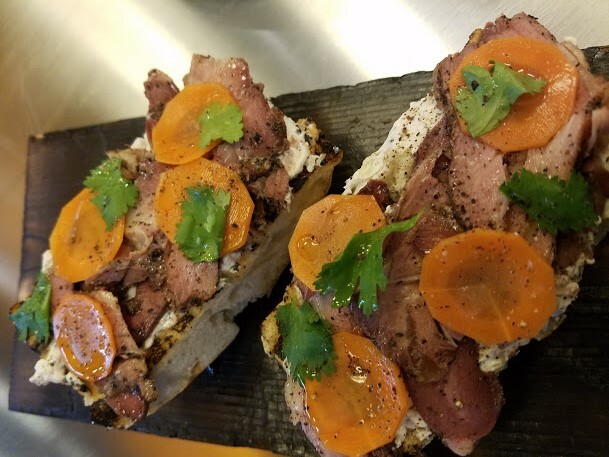 My friend chose the South Texas Wild Boar Toast, a colorful presentation of country bread, pepper smoked wild boar ham, Texas armadillo egg spread, and pickled carrots. 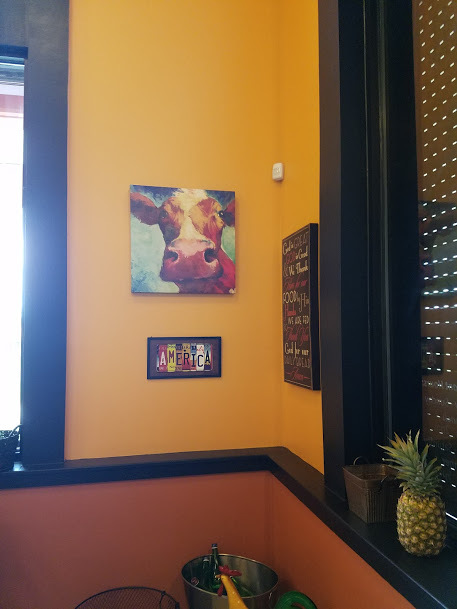 I did sample, because I like boar and when it’s available I order it. The bread was a little too thick for me but the “armadillo egg” salad lent creaminess when combined with the boar that was smoked to perfection, a smoky pepper taste, which complimented the pickled vegetables. Bright would be my descriptive word. For our main dishes, my friend chose JJ’s Beef Stroganoff, a flavorful sauce containing braised beef, roasted mushrooms and garlic with sour cream, egg noodles and savory herbs. 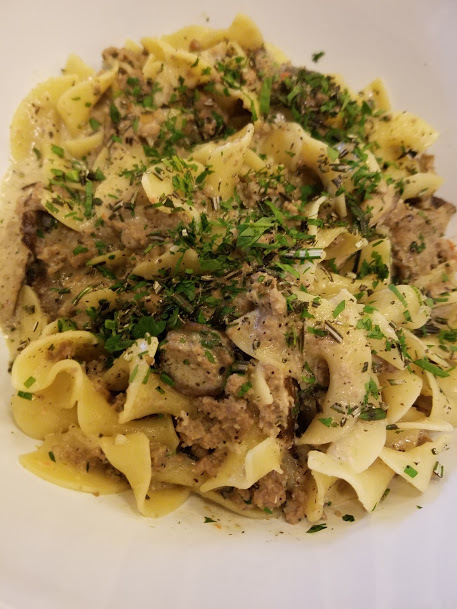 One of the nicest Stroganoff dishes I have tasted, meat tender, enough mushrooms to lend an earthy taste and once again Chef Gilbert’s generous use of fresh herbs shone through with each bite. We both gave this dish high mark. 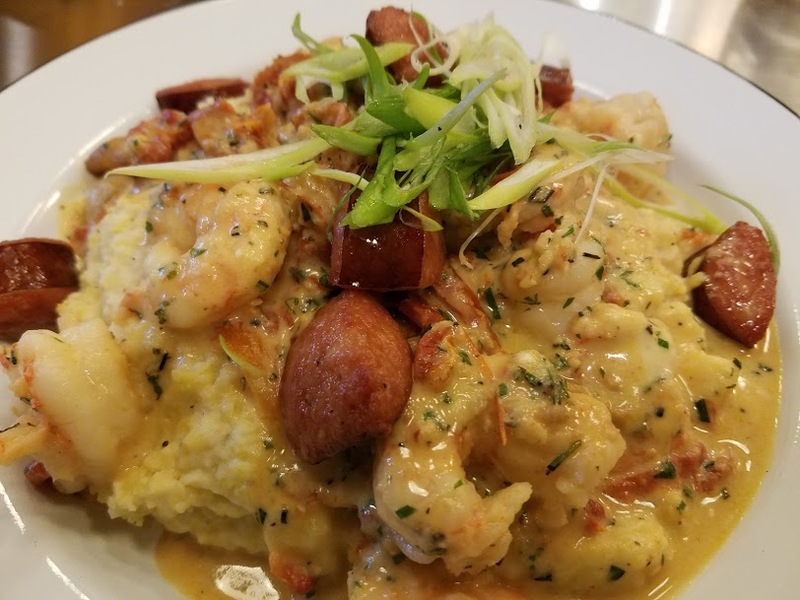 I went with my favorite the Local wild Shrimp and Grits, packed with flavor, stone ground cheese grits, and black pepper queso, sun-dried tomatoes, sausage roasted garlic. 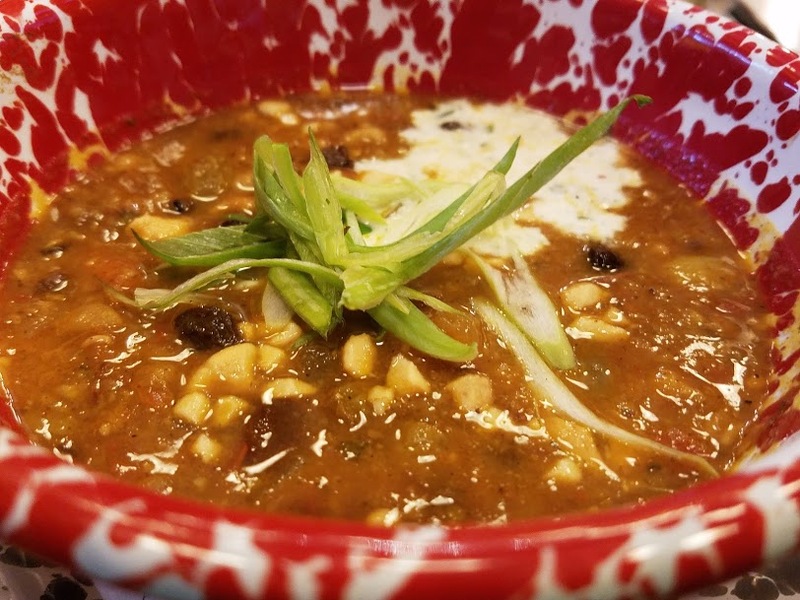 This dish is served in the Fernandina location and I am pleased that it made the menu at Gilbert’s Social. This dish also scored a 10 out of 10 on our scale. 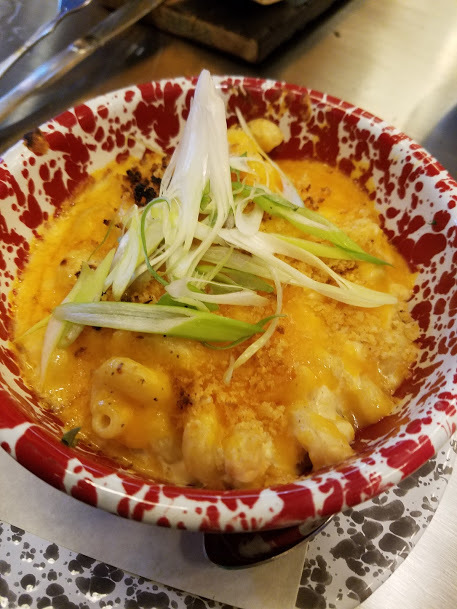 And just because we can, we ordered Anna’s Mac and Cheese, a most creamy combo of black pepper queso, cavatappi pasta, pimento cheese, cheddar, saltines cracker crust and the Crispy Smoked Pork Belly with butter pecan puree, pickled pineapple and basil. First bite the Mac and Cheese made my toes curl that’s how good it was. There are some really good Mac and Cheese dishes in town and I have tasted many of them, this far surpasses any I have tasted. 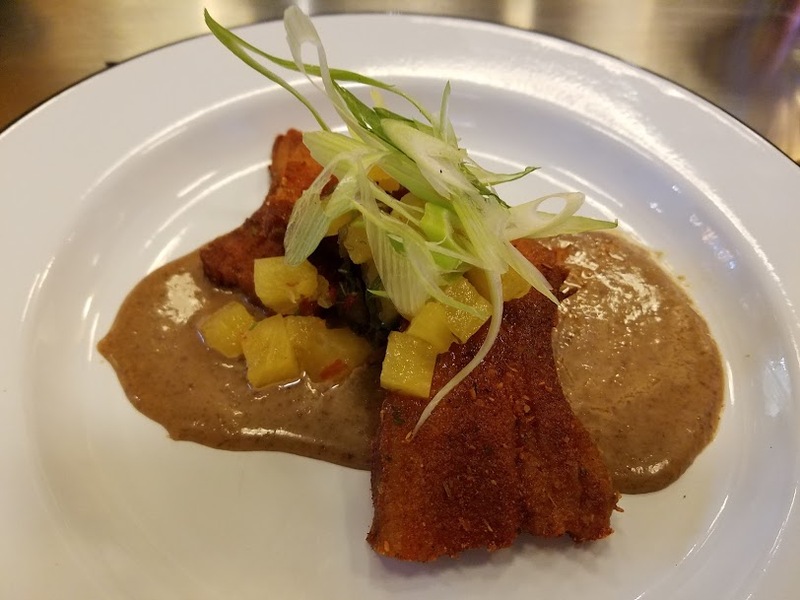 Pork belly was crisp and the sweetness of the puree, combined with the tartness of the pineapple cut the richness of the meat, again another complex dish that makes me appreciate the talent, work and passion Chef Gilbert brings to each of his creations. There was absolutely no room for dessert, but there will be more time for a return visit. So I can only urge you get your favorite besties they will love you for it, and get over to Gilbert’s Social, lunch, dinner or both. Chef Gilbert is a force to behold as he easily works between the kitchen, checking dishes before they are taken to the tables, and of course his trademark visiting each table to welcome and thank each diner. 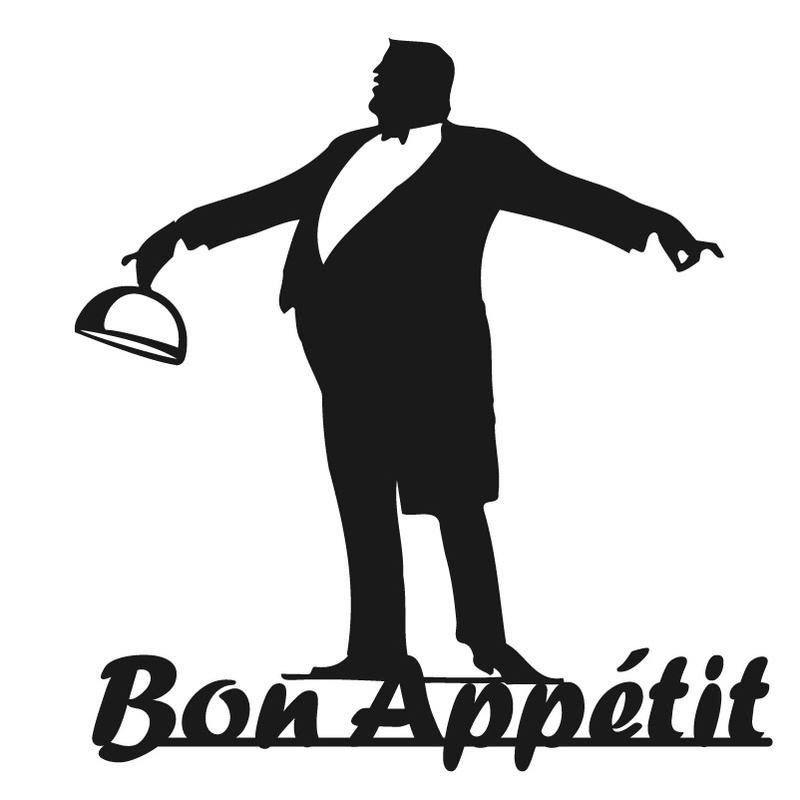 The restaurant is running like it has been opened for months, staff savvy and helpful. Our server James was a total delight, and was able to answer any questions we had. I would advise using Open Table to make reservations, perhaps not for lunch but dinner for sure.